You could go broke buying turkey smoking equipment, especially if you're new at smoker cooking. But if you've been smoking foods for a while you might already have everything you need. MY TRUSTY WEBER SMOKEY MOUNTAIN SMOKER! Sure, you could smoke a turkey without owning a lot of fancy gizmos and gadgets. Find a free bucket for brining the turkey or don't brine at all. Season with just salt and pepper and smoke it using scrounged up apple tree branches. And have faith that the pop-up indicator in your turkey activates at the right temperature. Those pop-up things are infamous for their inaccuracy. You could do it that way, but having a few doodads could make the turkey smoking process easier. And more fun. And your smoked turkey would probably taste better, too! Some of the accessories and tools on the list aren't necessary, but are nice to have. An electric carving knife is one of those luxuries, even though mine does a heck of a lot better job than my sharpened carving knife. Some items are pretty much required, like having a reliable smoker and a good quality smoker thermometer. This list doesn't include the recipe ingredients. Just jot down your own for your smoked turkey recipe, and include the ingredients needed for brining, marinating, injecting, and basting. Spices and herbs lose flavor over time, so it's a good idea to replace the old stuff in your spice rack. I tried to include all the accessories and tools needed for most turkey smoking methods, although I probably forgot something really important! So as soon as you've picked a smoked turkey recipe and the smoking method, sit down and think it through. Mentally walk yourself through all the steps and consider the equipment you'll need to accomplish each one. You might find you need (or want) something that's not on the Turkey Smoking Equipment Checklist. The Amazon ads below are just a convenience for you. Check out the turkey smoking equipment at Amazon, learn about the tools and accessories, then head over to Walmart if you want. You can probably find some things cheaper there. That's what I'd do. I always shop for the best deals. Most of the products displayed have high ratings, or are things I actually own myself. Look around and you might find the same or similar equipment at a significantly lower price. When you visit one of the Amazon links from my site and then buy something I earn a small percentage of the sale. It doesn't affect the price you pay one bit. I use an old insulated 5 gallon water jug for turkey brining. Lowe's hardware stores usually have food grade 5 gallon buckets available for a few bucks. The bucket liner bags will keep the interior of your brining container like new. You can get kosher salt at any grocery store for a lot less than Amazon's price. From what I've learned, Diamond Crystal is the purest kosher salt available. Add Flavor to That Turkey! Dry rubs and marinades may need to have one or more of the spices and herbs ground up or crushed. An electric spice grinder or a mortar and pestle setup could make things easier. And that dry rub shaker can would help make applying the rub evenly easy. An angled baking rack comes in handy if you're positioning the turkey breast-down in the smoker. A drip pan will keep your smoker clean - turkeys leak a lot of juice when they're smoked. Measure the cooking chamber of your smoker before buying a rack or pan, just to make sure they'll fit. A beer can style turkey might be in your future. The string is for trussing the turkey. A long basting brush makes it a little easier to reach around the whole turkey without getting your hand in the heat. 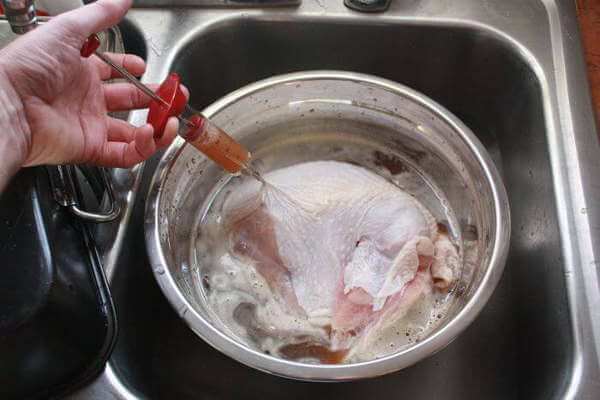 That drip proof turkey baster looks like a winner! Heat resistant grill gloves are nice to have, though you could just as easily use a pair of washable kitchen hot pads. And like I said earlier, electric carving knives rock for carving turkey. And roasts. And hot, fresh-out-of-the-oven homemade bread. It doesn't crush when sliced, so it'll soak up more butter! I own and use a ThermoPro TP20 remote smoker thermometer and really like it. I also have an older model of the Maverick thermometer, and still use it sometimes. Both serve me well. I also have a really nice Thermoworks "SMOKE" thermometer. It's more expensive, but the quality reflects the price. I place the remote thermometer meat probe in the turkey breast, and use a handheld instant-read to spot-check other areas, like the drumstick and thigh joint. I have a Thermopop handheld thermometer that's really quick! It takes only 4 seconds to accurately display the meat temperature. 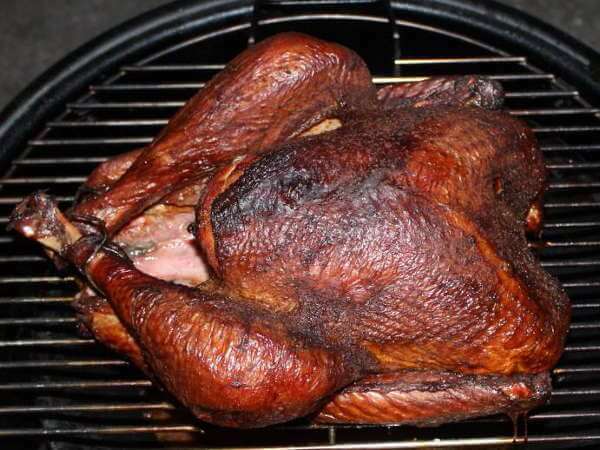 What Type of Smoker Wood Chips Are You Using For Your Thanksgiving Turkey? I've shown a couple of different variety packs below. One is wood chips, the other is smoker pellets. Looking around I saw that peach wood chips are available, if you're so inclined. If you're grill smoking a turkey, the stainless smoker box would be nice, but wrapping chips in foil would be cheaper. I love using the Weber Smokey Mountain, and it does a great job once you get a handle on how to adjust the vents to maintain the temperature. I've been using my Masterbuilt digital electric smoker a lot lately. I smoked 3 baby back rib slabs a couple days ago, and 6 more slabs would've fit in there if I wanted. I will be smoking my Thanksgiving turkey in my Masterbuilt this Thanksgiving. My Char Broil gas smoker is a smaller model, without the lower door. I take it with me when I snowbird in Arizona, where I'll be heading in a few weeks. It does a good job but is sensitive to winds. Gotta put up a windbreak when I use it. And my Weber kettle has gotten lots of use too. By banking the charcoal against the sides, I've used it to smoke some tasty briskets, chickens and disassembled turkeys. One piece of turkey smoking equipment I own but didn't mention is my Char Broil Big Easy Infrared Turkey Fryer. It's a great substitute for the conventional oil-using turkey fryer, and cooks the turkey really fast! Drop in a few wood chips around the perimeter of the bottom and it'll produce some smokey flavor.